The preschool portion of the LabLearner program was assessed over a five-month period in eleven preschool classrooms, including Head Start and STEP classrooms, in three different states: Pennsylvania, Florida, and Virginia. The goal of the assessments was to determine whether the LabLearner Preschool Program fostered the development of critical thinking, problem solving, numeracy, fine motor control, oral language, and literacy skills in preschool children. 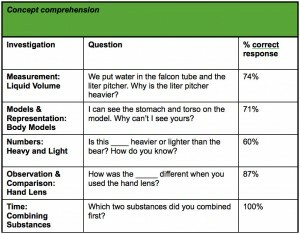 Two areas of impact were evaluated: receptive and expressive science tool vocabulary, and science concept comprehension. A total of 100 matched cases of preschool children aged 3.5 and 5.5 years were included in the study. Results showed that children’s receptive and expressive vocabulary for the science tool names increased over time and these gains were statistically significant (p< 0.05). With regards to science concept comprehension, the study centered on the question of whether children would be able to grasp (and be able to articulate or otherwise demonstrate) an understanding of the most important concepts contained within selected LabLearner activities. Focus Questions were developed for selected activities, and example linguistic and behavioral responses were listed for teachers to compare children’s responses to as they reported them. Teachers reported whether or not the child could successfully answer the question. 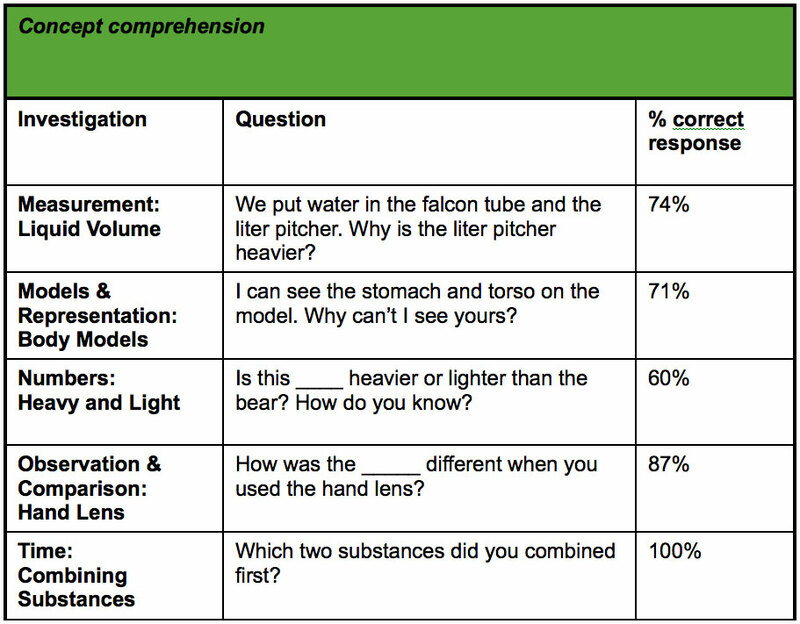 The table here provides an example of the types of focus questions used in the hands-on science investigations. The complete descriptive data for the study showed that for the majority of the science activities, children were able to demonstrate an understanding of the central scientific concept, either using language, or appropriate behaviors.